I'm always looking for a fun project to do with my kids.... they LIVE for art projects, and it's one of those things that brings all 3 of them together, despite their 6 year age spread. Yesterday, I came across an adorable project from Positively Splendid that we are going to use for Valentine's treats for friends. 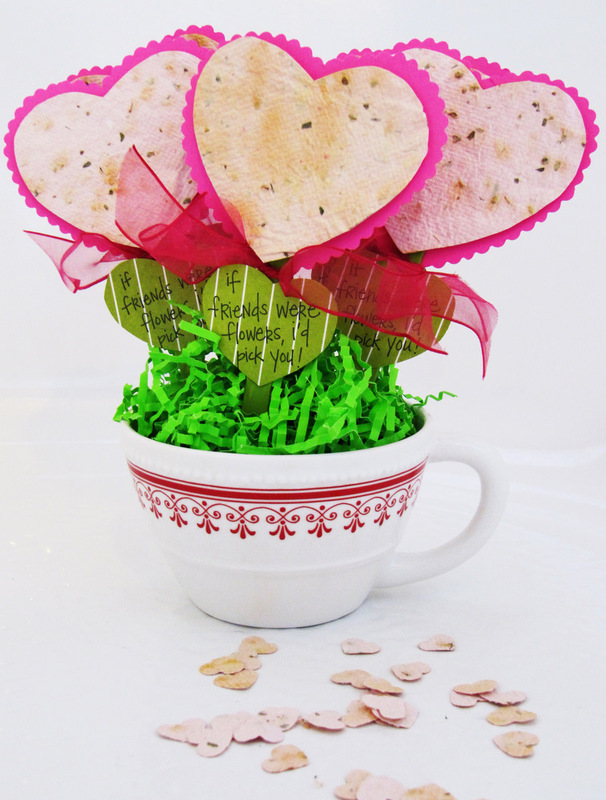 It's a sweet Valentine to hand out to classmates and friends, but here's the kicker...... you make your own paper and include some wildflower seeds. 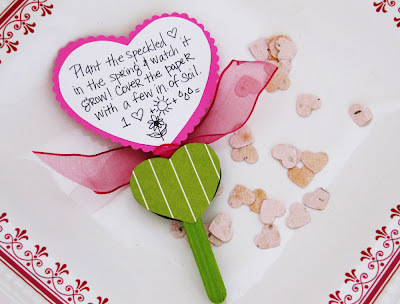 Then the kids get to "plant" their paper this spring to create their very own little flower garden. Amy, the creator of this crafty idea, says, "I absolutely adore a craft project that utilizes things that would otherwise be discarded. See the speckled paper hearts at the center of each of these blooms? My kiddos and I took an afternoon to make that paper together using paper scraps and other ingredients we had on hand, and we had tons of fun in the process. The kids were fascinated by the fact that it is possible to take something used and make it new again, which makes this a truly stellar lesson in recycling. Once the paper was completely finished, we used it the next day to craft the flower Valentines you see here. Why flowers? you might ask. That, friends, is the very best part of this project: Our homemade paper contains a magic ingredient, and the heart centers made out of it can be planted in the spring so that wildflowers can grow as a result of our hard work! " Please go visit Amy at Positively Splendid and check out her very detailed step-by-step tutorial and get your own jump-start on those Valentines favors today. I can't wait to make some homemade paper and create these with my own kids. Happy Friday! Thank you so very much for spotlighting this project! I truly appreciate it, and I'm so glad you enjoyed it. I'd love to see your creations when you finish them! So, so cute! I'm a client of Jonathan's, and I had the joy of receiving one of your cute Christmas cards with the blog address. I'm helping my brother and his fiance prepare for their spring wedding. Do you have any fabulous links or suggestions on printing favor tags or table decorations, etc? Please share if you do. Thanks so much for stopping by! So glad you are enjoying my blog. And as far as weddings, I know there are fabulous wedding websites out there that could probably give you some great ideas. I generally focus a little more on children's parties, so I'm not all that knowledgable about the wedding scene, but Celebrations at Home, Pizzazzerie and Hostess With the Mostess are 3 terrific websites for all things party related. And Project Wedding might be a good one for some wedding ideas. If you need some custom designs for the favor tags, etc, I do custom work all the time. You can email me at shindigparties@gmail.com.